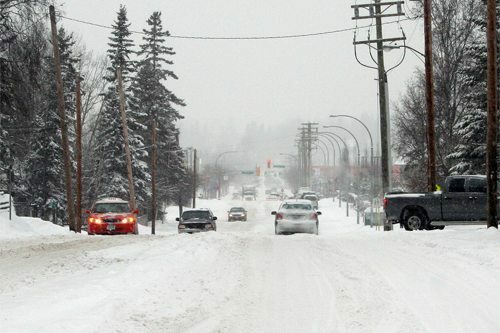 On average, 51 crashes involving injury or death occur in the North Cariboo Region in February. That’s according to ICBC spokesperson Ingrid Brakop, who said that number is calculated from police data of a five year span. Brakop said they’re urging drivers to do their part to prevent crashes by adjusting their driving and properly equipping their vehicle for the road conditions. Winter weather in northern B.C. presents its own set of challenging road conditions for drivers – namely, black ice, heavy snowfall and freezing rain. In bad weather, slow down, increase your following distance and allow extra travel time. Focus your full attention on the road and use extra caution when approaching intersections and corners – they may be icy. Consider using your headlights and taillights whenever weather is poor and visibility is reduced – not only at night – to help you see ahead and be seen by other drivers. Keep in mind that daytime running lights usually don’t activate your taillights. Ice and snow can hit unexpectedly so make sure your tires are rated for the conditions you’ll be driving in. Check your tire pressure regularly – pressure drops in cold weather and overinflated tires can reduce gripping. Clear off any snow that’s built up on your vehicle before driving including headlights, wheel wells and external sensors if you have a collision warning system. When severe winter weather hits, consider alternatives – carpool with a confident driver whose vehicle is equipped for the conditions, take a taxi, work from home or at least wait until the road crews have cleared major roads. Sometimes the best option is to leave the car at home. In poor weather, use extreme caution around snow plows. Maintain a safe following distance and don’t pass them – it’s not safe. These vehicles may be equipped with a wing blade on either of its sides which may not be visible due to the snow it sprays. For detailed tips on how to drive in winter weather, visit icbc.com or ShiftIntoWinter.ca.